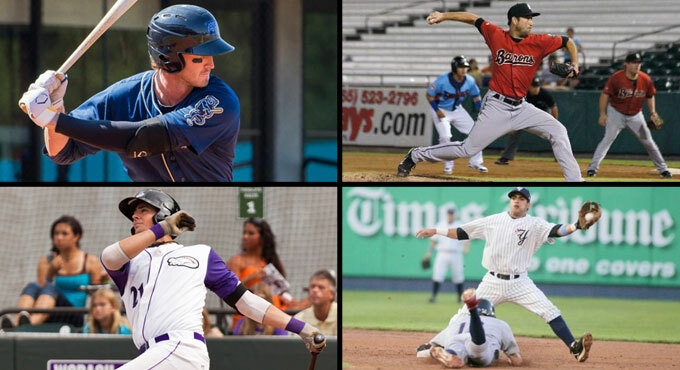 (Central Islip, N.Y., April 9, 2015) – The three-time Atlantic League champion Long Island Ducks today announced the signings of first baseman Jon Griffin, right-handed pitcher Ryan Kussmaul, catcher Mike Blanke and infielder Reegie Corona. All four will begin their first season with the Ducks in 2015. Griffin joins the Flock after spending the 2014 season with Double-A Mobile in the Arizona Diamondbacks organization. He compiled 15 home runs, 53 RBI and 14 doubles in 109 games. In addition, he set a Southern League record by launching a homer in five consecutive at-bats, including four during a single game on May 21 against Tennessee. The Florida native also earned a Southern League All-Star Game selection this past season. The 25-year-old has four seasons of professional baseball experience, all in the Diamondbacks organization. His best year came in 2012 with Single-A Visalia when he batted .300 with 26 home runs, 98 RBI, 19 doubles and 249 total bases in 128 games. In 2011 with Rookie-level Missoula, he led the Pioneer League in home runs (18) and ranked third in RBI (59) and games (71). The University of Central Florida alum has a .271 batting average in 416 career games along with 71 home runs, 276 RBI and a .989 fielding percentage. Griffin was drafted by the Diamondbacks in the 21st round of the 2011 amateur draft. Kussmaul comes to Long Island after spending the 2014 season in the Chicago White Sox organization. He pitched in 11 games with Double-A Birmingham and 33 games (one start) with Triple-A Charlotte, combining for a 5-5 record with a 4.08 ERA, five saves and 74 strikeouts in 68 and one-third innings. The righty has played six seasons of professional baseball, including five in the White Sox organization after being signed as a free agent in 2010. The 28-year-old spent most of 2012 and all of 2013 with Birmingham and was named a Southern League All-Star in both. He appeared in 37 games in 2012 and posted career best totals in ERA (1.11) and saves (13) while striking out 61 batters. The following season, he went 2-1 with a 2.43 ERA, five saves and 36 strikeouts in 23 games. In 178 career games (13 starts), the Wisconsin native has a 20-10 record with a 2.65 ERA and 375 strikeouts. Kussmaul was originally drafted by the Florida Marlins in the 2006 amateur draft. Blanke has played five seasons of professional baseball, all in the White Sox organization, and reached as high as Double-A Birmingham in 2013. That season, he totaled seven home runs, 43 RBI, 25 runs, and 15 doubles in 94 games and earned an All-Star Game selection. The 26-year-old set career highs in home runs (10), RBI (50) and doubles (24) with Single-A Winston-Salem in 2012 and was named a postseason All-Star in 2010 with Rookie-level Great Falls. In 2014, the Canada native was converted to a pitcher for a single season with Great Falls. In 13 games, he compiled a 4.72 ERA and 10 strikeouts in 13 innings pitched. In 375 career games, the University of Tampa alum has a .254 batting average with 33 homers, 179 RBI, 81 doubles and has thrown out 33% of base stealers. Blanke was originally drafted by the White Sox in the 14th round of the 2010 amateur draft. Corona made his Atlantic League debut in 2014 as a member of the Lancaster Barnstormers. He appeared in 24 games and accrued three RBI, 11 runs, two doubles and three stolen bases. He played the first eight seasons of his career in the New York Yankees organization, reaching as high as Triple-A three separate times (2009, 2010 and 2013). The 28-year-old was selected to play in the All-Star Game three times during his career. His first trip came in 2006 with Single-A Charleston of the South Atlantic League when he batted .292 with 40 RBI, 52 runs, 13 doubles and 26 stolen bases in 96 games. He earned the honor the following season with Single-A Tampa in the Florida State League, and in 2009, he was chosen while with Double-A Trenton of the Eastern League. Corona was originally signed by the Yankees as a free agent in 2003.